April 4, 2019, 4:10 PM · Welcome to "For the Record," Violinist.com's weekly roundup of new releases of recordings by violinists, violists, cellists and other classical musicians. We hope it helps you keep track of your favorite artists, as well as find some new ones to add to your listening! Norwegian Radio Orchestra, Miguel Harth-Bedoya conducting. On their new album "Revolution," three brothers - pianist František Janoska, violinist Roman Janoska and violinist Ondrej Janoska join bassist Julius Darvas (their brother in-law) in arrangements of works by classical composers like Mozart, Kreisler, Wieniawski and Bach, as well as three new compositions by the Janoskas themselves. The album also includes several arrangements of top hits by the Beatles in the Janoska style, wich as "Penny Lane" and "Let It Be." To coincide with the release, the Janoska Ensemble will embark on a 10-city U.S. tour, performing a program based on the "Revolution" CD. Their stops include Texas, New York, Virginia, Arkansas, Tennessee, Indiana and Wisconsin. BELOW: Janoska Ensemble performs "Melodie For Melody," written by Roman Janoska for his daughter Melody on the occasion of her birth. 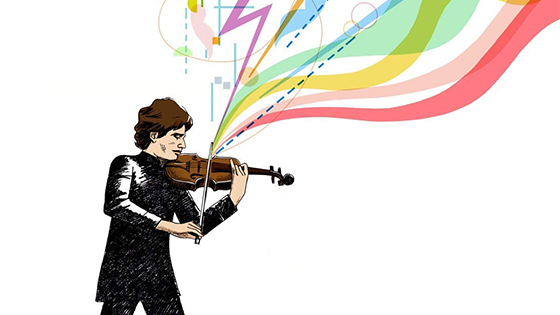 April 4, 2019 at 09:25 PM · I just heard Augustin Hadelich play the Barber with the Colorado Symphony on Sunday and he was great as ever. He got slightly covered for a few non-essential bits, so I wondered if that was an orchestration mistake on Barber's part, or if that was a balance issue or the fault of the bad acoustics in the concert hall (which has terrible acoustics). He was great in the Brahms concerto a few years ago. April 4, 2019 at 09:31 PM · I blame Boettcher! :) Always love hearing Augustin play. April 5, 2019 at 12:17 PM · I don't know where that drawing of Hadelich comes from, but I have to say that I love it! Seems to be such a perfect expression of his playing: pure light going through a violin into an array of colours! Awesome! Cheers!